What Falcons and Black Knights fans need to know as Air Force fights for bowl eligibility and Army attempts to pull a home upset. Who, where, when: Air Force (5-3, 4-1 Mountain West Conference) at Army (1-7), Saturday, noon Eastern. TV: CBS Sports Network (Ben Holden and Randy Cross have the call). Gambling is illegal in most states: Air Force is a 7.5-point favorite. Would Air Force coach Troy Calhoun agree with that line? : Probably not, given all of Army’s advantages. Speaking of good: Good news for Army’s defense in the form of senior linebacker Nate Combs, who leads the team in tackles for loss despite missing the last two games with a shoulder injury. He’ll be back this week, according to Army football guru Sal Interdonato — just in time to try and stop Air Force’s No. 2-ranked rushing attack (366.25 yards per game, behind only Army’s 383.13). In other Army injury news, sophomore fullback Larry Dixon is questionable; expect junior Hayden Tippett to see action even if Dixon’s healthy after Tippett rushed for a career-best 100 yards in last week’s loss to Ball State. Not-so-secret weapon: Senior Cody Getz ranks fourth in college football with more than 132 yards rushing per game, but aggravated an ankle injury against New Mexico two weeks ago and didn’t play against Nevada last week. Wes Cobb stepped into the top rushing role and quarterback Connor Dietz has remained a steady performer behind center, but junior wideout Ty MacArthur has gone from occasional pass-catcher and end-around threat to regular contributor. He’s racked up 170 yards rushing in the last two games, has taken over kick-return duties for an injured Anthony LaCoste and still finds time to be the Falcons’ leading receiver, catching 18 passes for 346 yards on the year. With Army’s defense keying on Cobb and Dietz, look for MacArthur to have a breakout day against the Black Knights’ young secondary. Army wins if: Its offensive line can take advantage of a relatively small Air Force defensive front and give Trent Steelman, Raymond Maples and the rest of the Black Knight backfield some big holes up front. … Combs and Co. can contain Cobb and MacArthur on the ground while avoiding the big play in the air (Falcons receivers are averaging 18.3 yards per catch). … The Black Knights can breathe some life into their special teams, especially a morbid punt-return average of 1.13 yards — last in college football. 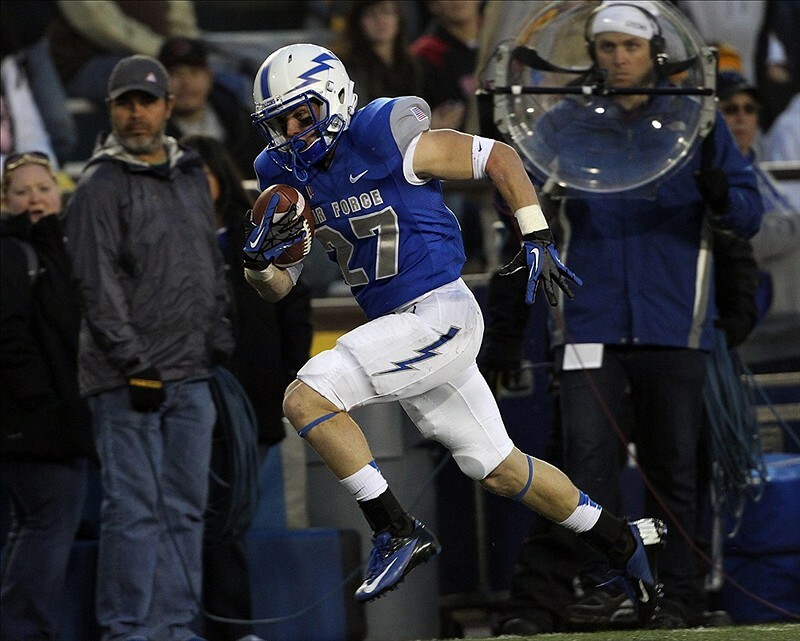 Air Force wins if: Its run attack continues to thrive without Getz. … Linebacker Alex Means and the rest of the defense shut Steelman’s option attack down early — Army’s shown no passing threat, making a come-from-behind win over a like-minded ball-control opponent almost impossible. … An early score or two take the West Point crowd out of the picture, keeping the Falcons from facing what could be a rowdy late-game atmosphere they rarely see in the MWC.